Fall is here. Along with the crisp mornings and turning leaves, you may have also noticed your skin feeling a little chapped and dry. When the season changes, so does your skin. This is a great opportunity to take advantage of the colder weather and ease your skin into the winter months gracefully. Now is the time to seal in the hydration. Clarks’s Botanicals Deep Moisture Mask is designed to hydrate, nourish and comfort dry, aging, environmentally damaged and dehydrated complexions. Natural ingredients work together to deeply moisturize and replenish the complexion, allowing it to regain radiance and suppleness over time. With regular use, fine lines and wrinkles will be diminished and a youthful glow will take their place. The mask hydrates and soothes skin quickly, and can be used year-round to nourish the skin and restore the natural glow. The high concentrations of algae extract, coupled with comfrey root, Jasmine Absolute, and Japanese Green Tea, make this mask a potent anti-oxidant treatment. It is thick and rich and instantly quenches the skin. It can be used as a weekly treatment or as a daily moisturizer. If used daily, only the smallest amount is needed. Skin will be noticeably plumper and hydrated. Make a few tweaks in your seasonal skin care to ensure healthy, glowing skin all-year-round. Some skincare lines come and go. This year’s miracle ingredient is often next year’s outdated science.Then there are those exceptional lines that not only deliver results, but are truly compelling because they are based on real human experience and a brand narrative not created by a corporate marketing team, but by a personal history. Clark’s Botanicals was born out of tragedy when company founder Francesco Clark, who then worked at Harper’s Bazaar, suffered a crippling spinal cord injury in a swimming pool diving accident on June 1, 2002. With his central nervous system impaired, Francesco lost the ability not only to walk, but even to sweat. This led to clogged pores and chronic breakouts. When neither over-the-counter nor prescriptive remedies worked, he turned to his father, Dr. Harold Clark, a physician trained in both traditional Western medicine and homeopathy. Even as the collection grows into a full-fledged skincare system, rebalancing skin remains its overarching objective. That’s why all Clark’s Botanicals products today feature Jasmine Absolute, a precious essential oil that naturally rebalances skin. Derived from nocturnally-blooming flowers, this extract is also antibacterial, anti-inflammatory and immuno-stimulating. It works to calm and heal a broad spectrum of skin types, from young to mature, oily to dry, and normal to sensitive. With a passionate consumer following, Clark’s Botanicals is pleased to announce its latest move into select, prestige retail distribution with updated packaging and a launch family of thirteen paraben-free treatment products. Francesco Clark serves as a National Ambassador for the Christopher Reeve Foundation, which is dedicated to curing spinal cord injury by funding innovative research and improving the quality of life for people living with paralysis through grants, information and advocacy. A percentage of profits from the sale of Clark’s Botanicals go to The Christopher Reeve Foundation. In the summer, bright and vibrant shades of cheek color is a surefire way to look younger and healthy. Use these products to emphasize a tan, create a youthful flush or mimic a lit-from-within complexion. Start by choosing the right shade for your skintone. To find your go-to blush shade, pinch your cheeks and then pick a color that mimics your natural flush. This trick will ensure that you’re choosing the most flattering color for your skin tone. If you have fair skin, try a cool pink. Medium skin looks great in vibrant apricot/peachy hues, and darker skin tones look radiant in fuchsia. Cream blush is a great way to instantly look fresh and dewy. Although it’s staying powder is not the best, especially in higher temperatures, cream blush is a nice alternative for dry skin. To ensure staying power on oily skin, first prime the skin and then set with a powder blush or translucent powder. To apply cream blush, smile and lightly focus the blush onto the apples of your cheeks. Then blend softly back and up toward the hairline. If you apply too liberally, tone down heavy application by blotting the excess color with a clean makeup sponge. Or, use a sheer, luminizing powder to diffuse excess color. The blush then looks like it came from within the skin versus sitting on top of it. 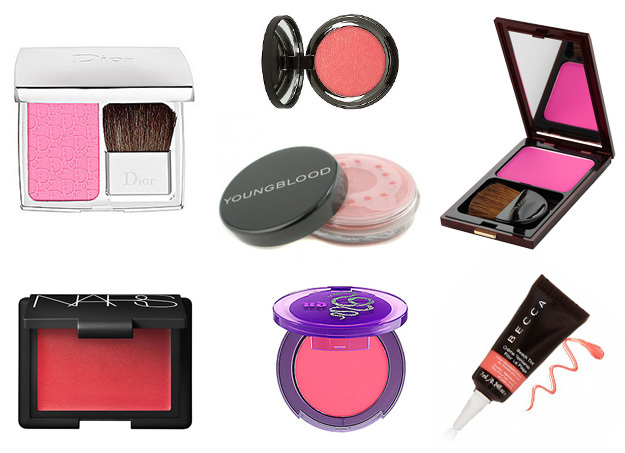 Youngblood Crushed Mineral Blush in Rouge: These blushes are incredibly pigmented and easy to work with. They blend beautifully and last all-day. They feel lightweight on the skin and never settle into lines. A small amount goes a very long way, apply with a light hand for a sheer wash of color or add more for vibrant glowing skin. Kevyn Aucoin The Pure Powder Glow in Myracle: Full Review HERE. NARS Cream Blush in Cactus Flower: On trend for summer, this bright coral blush is beautiful on both the lips and cheeks. The velvety texture is extremely easy to blend and apply. Subtle gold shimmers hide in the coral to help create perfectly flushed, luminous skin. BECCA Beach Tint in Guava: This is the perfect color for summertime. It resembles the act of playing in the sun a little too long. The water-resistant formula can be used on both the cheeks and lips. Produces the most natural-looking flush and smells like summer. Urban Decay Afterglow Glide-On Cheek Tint in Quickie: A lightweight cream blush that does not pull or disrupt a base. It can be used on top of foundation, powder… anything. The formula is sheer but buildable. The staying power is not the best, but I am obsessed with this color. Quickie is a sheer bubble gum, electric, cotton candy pink. The minute it is applied, it creates instant youthfulness.